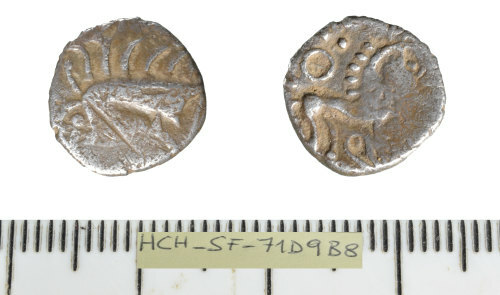 Obverse description: Stylised boar right, spear in front piercing ears, pellet rosette or rings of pellets above, pellet below. Reverse description: horse prancing right, pellet triads either side of wheel above, phallic motif between pellet triads below. Rudd (ABC) : p. 85, no. 1582.